I found myself in North Carolina last week for a conference and figured that I’d make the most of the trip and took some extra vacation days. 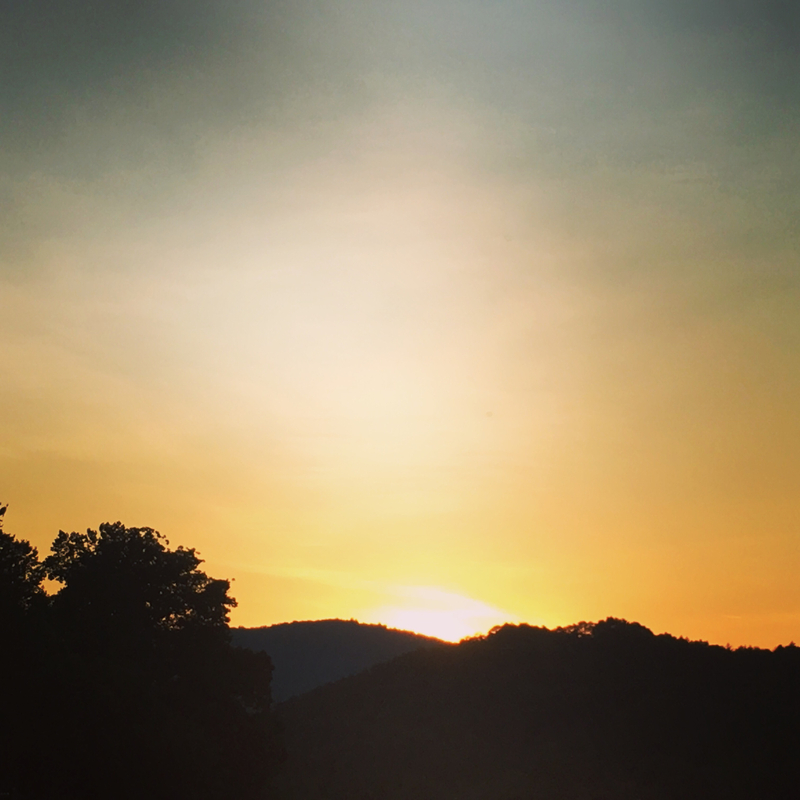 When the conference wrapped up Sunday I hopped in the truck, pointed it west, and landed in Helen, GA a few hours later. I’d already planned ahead and had a half-day guided trip booked for Monday morning. After enjoying a pretty sunset following dinner, I settled into the hotel room and went through my gear to make sure it was ready. 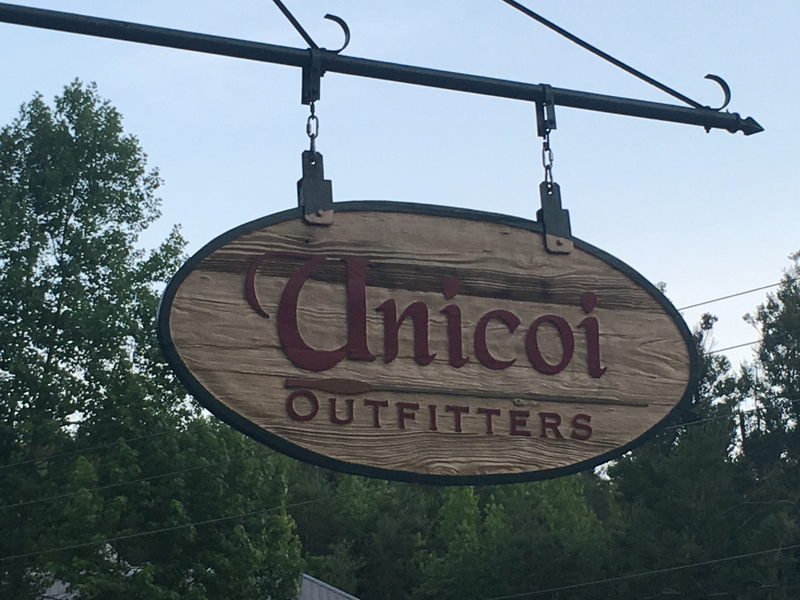 I arrived at Unicoi Outfitters bright and early to be there when the doors opened. While I waited for my guide to arrive I spoke with Jimmy, one of the employees. My Sage 1850 was acting wonky and he checked it out. We thought the spool was rubbing (I hadn’t used it since the Idaho trip) but it seems to be an internal problem. No worries. Jimmy hooked me up with one of their new Orvis reels. About that time my guide George arrived. We got busy getting the rod rigged, pulled on the waders and boots, and walked out back to the gorgeous section of private water that the shop leases. It took quite a while (almost a hour) to land my first fish. 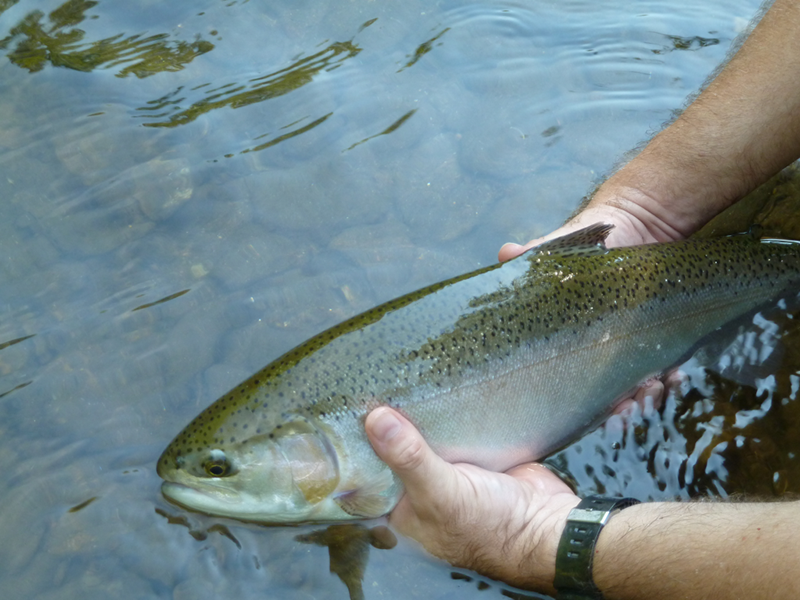 He wasn’t very big but the pressure was off…I’d successfully landed a trout! The next hookup ended up being a personal best. I don’t think a redfish has ever given me the adrenaline rush this guy did. My heart was pounding out of my chest by the time he reached the net. I couldn’t believe it when I lifted him clear for the photo op. What an absolutely gorgeous, 21″ beauty. After I released the brute I managed to miss several others. I really need to work on setting the hook better. It ain’t a strip set like saltwater, guys. Throughout the course of the day, George gave me tips on roll casting, mending the line, etc. We tried dries and nymphs and worked all over the section of water. We had a great time and it felt like I was fishing with my grandpa. George had told me how the trout weren’t very aggressive and that I needed to put the fly in a drift right over them. 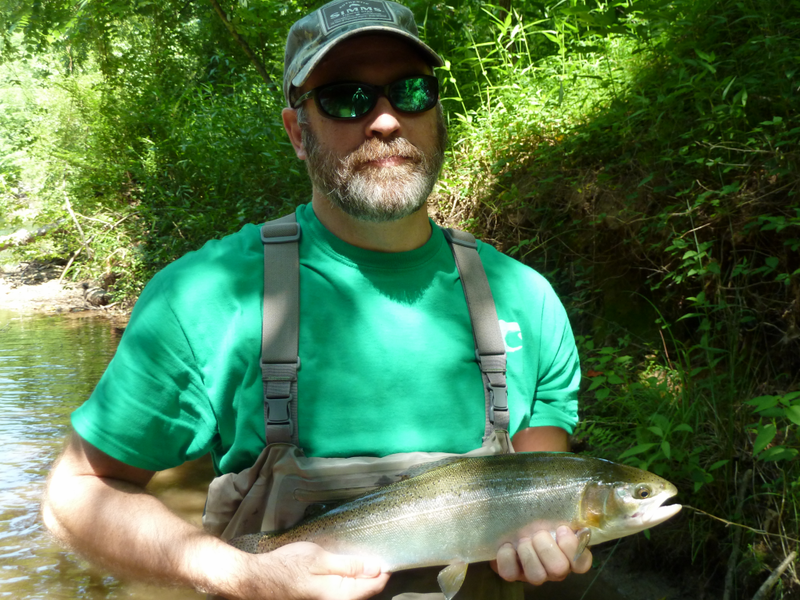 Well, that changed when a beast that had to be bigger than the 21″er chased the dry fly downstream and inhaled it. Since he was swimming away and I raised the rod perfectly I swear I had a good hookset on him. Alas, after a good thrashing he came off the line. That one really smarted. 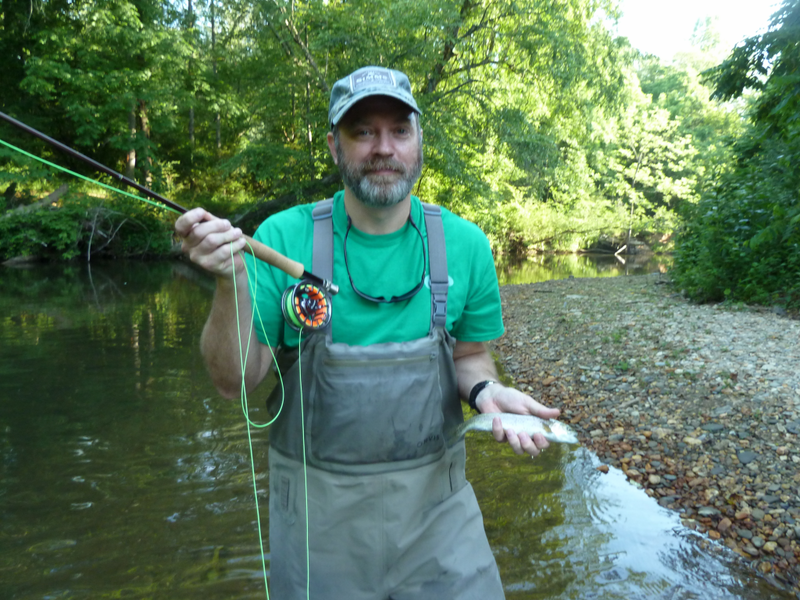 Even though he wasn’t the largest fish of the day, this 16″-er was probably the most fun. As soon as he was hooked he ran for the hills. If you’ve never heard it before, the sound of a fish stripping line off your reel at a blinding rate is music to the ears. 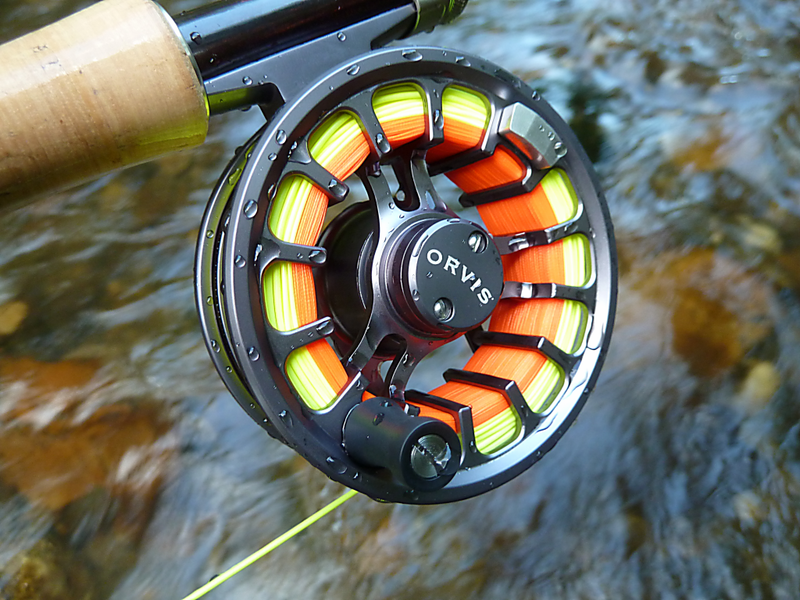 As he turned back towards me I was grateful for the quick pickup of the Orvis reel. Just when I thought it couldn’t get any better he launched himself out of the water and gave me a tarpon-like leap clearing 2-3′. Talk about an absolute rush and unexpected turn! Not long after landing this guy I was hooked up again. He literally got within inches of the net and looked to be a little larger (I’d estimate about 18″) than the last specimen. Unfortunately I bent the hook on him and he was gone. George didn’t think I put to much pressure on him. I guess those are just the breaks. We decided to go back to see if we could get the beast to strike again and headed downstream. 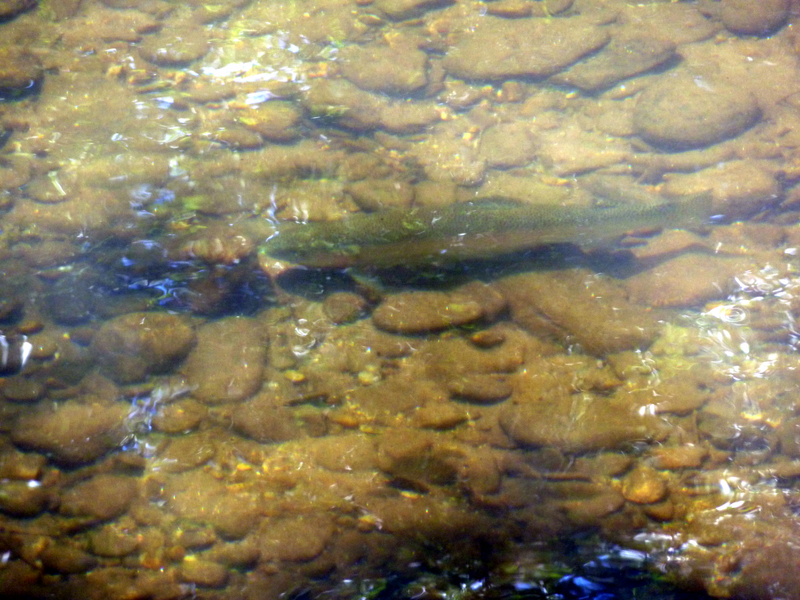 I was surprised to see several large trout just a few feet off the bank. I found it interesting that they were in the full sun instead of hidden away in the safety of the shadows. I counted five or six beautifully-sized fish. Even more surprising is that they didn’t bolt when we entered the water. I’m so used to spooking reds and you seldom see them again. These guys just sauntered a few feet away and then returned. Despite my best efforts, though, the beast didn’t arrive and I couldn’t get his friends to show much interest. One almost put his mouth on another dry but he turned at the last minute. I did manage to catch a new species as well. 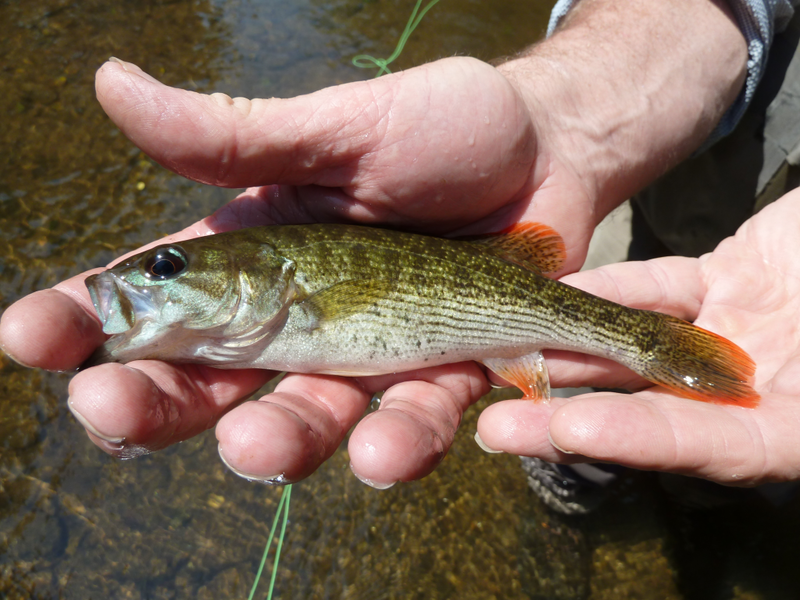 I thought I had a little trout on the end of the line but it ended up being a redeye bass. George said they don’t get much bigger than this. He had gorgeous color. If you’re ever in the North Georgia area with time to kill, I’d highly recommend booking a trip with Unicoi Outfitters. They have several sections of various rivers to offer up and I know I’m looking forward to getting back. 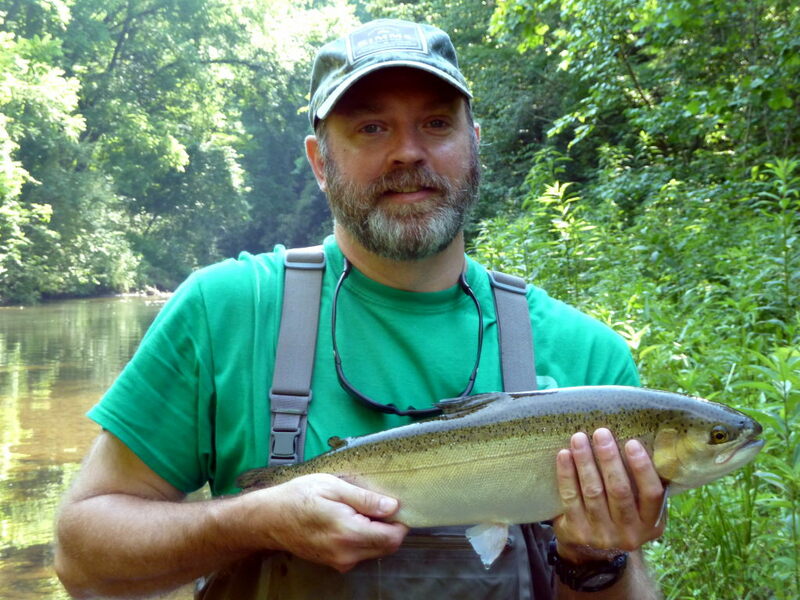 This entry was posted in reports and tagged chattahoochee, epic, georgia, nacoochee, trout, unicoi. Bookmark the permalink.